The 40th Metro Manila Film Festival (MMFF 2014) was a success, with a final gross of P1.014-billion in the box-office. Star Cinema-Viva, Vice Ganda-Wenn Deramas collaboration 'The Amazing Praybeyt Benjamin' emerged as the Festival Top Grosser. MMFF 2014, which ran for 14 days, December 25, 2014 to January 7, 2015, exceeded its 1 billion gross income target. 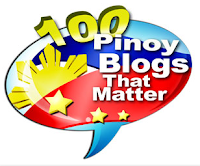 Last year's MMFF nearly reached that mark with 999M. Based on a tweet posted by TV5 reporter MJ Marfori (@mjmarfori) last Thursday, MMDA revealed that MMFF 2014 had a total 14-day gross earnings of P1.014B, which is just 1.5% higher than in 2013.
talkin' about actual tickets sold, I think last year was still higher. MMFF 2014 should have earned much higher than the 1.014B, given the higher ticket price. grosser was 'The Amazing Praybeyt Benjamin', which crossed P400-M mark after 13 days. Based on my ESTIMATES, 'Praybeyt Benjamin 2' could have possibly earned P407.2M as of January 7, the end of the festival. Kris Aquino-Coco Martin starrer 'Feng Shui 2' on one hand came 2nd with an estimated P213.9M, while 'My Big Bossing' had an estimated P120.7M. In 4th was the delightful surprise 'English Only, Please' with an estimated P91.2M gross, while 'Kubot: The Aswang Chronicles 2' took 5th with P81.1M estimated gross. The Bottom 3 films ('Shake, Rattle & Roll XV', 'Bonifacio: Ang Unang Pangulo', 'Magnum Muslim .357') share the remaining P99.9 million. 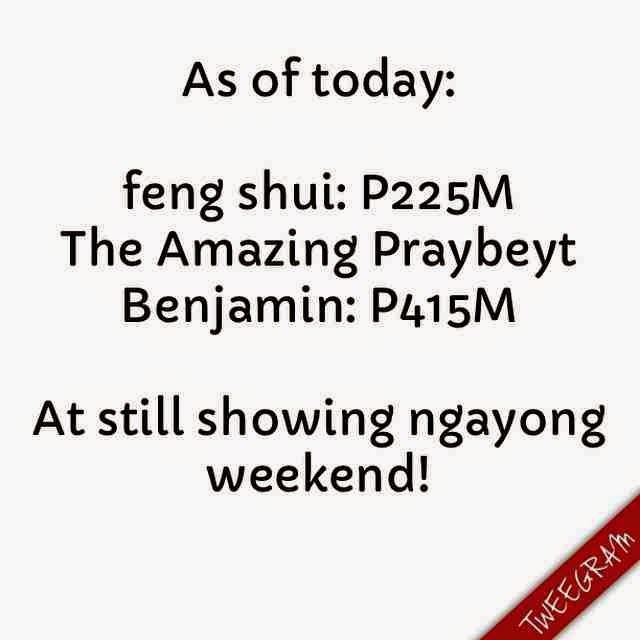 Meanwhile, Star Cinema's Mico del Rosario update on Instagram, 'The Amazing Praybeyt Benjamin' already has P415M and 'Feng Shui 2' has P225M gross receipts as of yesterday, January 9, 16 days after they opened in theaters.